Finding the perfect camper for your needs is a little like goldilocks hunt for the perfect porridge. It’s often lost that the camper should be a tool for exploration and travel, rather than the goal itself. Get a camper that requires a few hours of setup each day and you’re far less likely to push on late into the night for that perfect sunset campsite. Just as risky, find a camper that’s not quite comfortable enough and the family might turn their noses up at the idea of piling in for a month exploring the Daintree rainforest. It’s a problem that’s plagued would-be adventurers for years, and made only too hard by flashy salesrooms and aggressive discounting. So what exactly is the perfect camper for you? Below we’ve taken a look at the 7 most typical layouts you’d find, gone through their un-mentionables, their pros and cons, and what to keep an eye out for in the future. It might not get you laser focused on the camper you need, but hey, half the fun is figuring it out right? 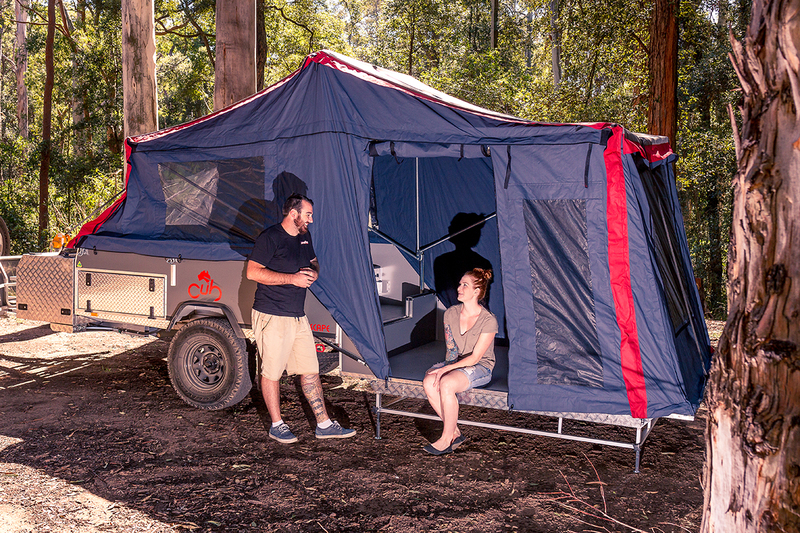 For years soft floor campers dominated the Australian landscape, and for good reason. 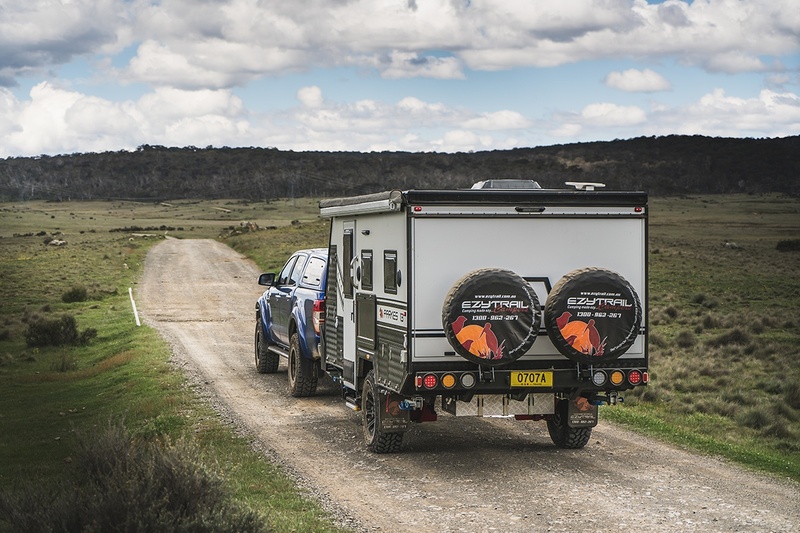 Not only were they some of the earliest camper trailer designs, they’re also some of the simplest to manufacture, and therefore a fantastic budget option even today. They’re typically a box trailer, with the bed up top, slide out kitchen underneath, and a tent that’ll fold up and over. Of course, the market doesn’t begin and end at the budget range. There’s quality locally built options that’ll see the price climb, but the fit and finish typically climbs at the same time. While imports and locally built campers might look similar, they’re often very different functionally. Sure, they’re kitted out with extensive storage setups, nicer kitchens, and better-quality components, but there’s typically far more effort put into quick setup times – a vital aspect for get-up-and-go campers. In either case kids will be down on the floor so factor in a set of stretchers to keep them off the ground. You’ll also want to bring a tarp to put underneath, it’ll make keeping it clean a whole heap easier. Perfect for: Price sensitive campers and those with small tow vehicles. The next huge boom in the off-road camper world was rear-fold campers. They’re essentially a re-think of the old soft floor campers, although with a hard floor. The bed’s still up top and the bulk of your storage underneath. Due to the rear fold design kitchens kick out the side, and most of the storage is accessed along the sides too. Setup wise they’re functionally the same as a soft floor meaning they keep fairly low height profiles which is good in windy conditions. Because the floor folds rearwards, the total footprint is still fairly large so care has to be taken positioning them on your prefered site. Layout wise they offer good space four four, mum and dad up top, kids down the bottom on stretchers but this time on a hard floor raised off the ground. Those with crook knees and backs may find comfort in higher end models. The height difference being internal means top spec models can often have a gentle climb up broad steps to get into bed, compared to the ladder style in most soft floors. 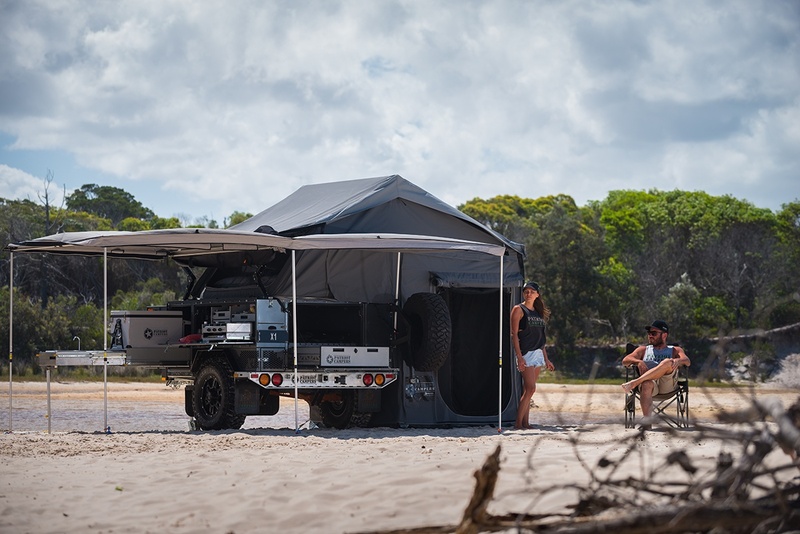 They do offer significantly quicker setup times than most soft floor campers too, and you’re physically up off the ground making them better in cold climates. High end local manufacturers are currently pushing hard with high-tech rear folds. Lightweight construction, push-button opening and expanded storage make them appealing for two up travellers. The logical progression, and current front-runner in just about every remote campsite are the forward fold campers. Like the rear folds, a forward fold camper gets you up and out of the dirt, although in a slightly unconventional manner. 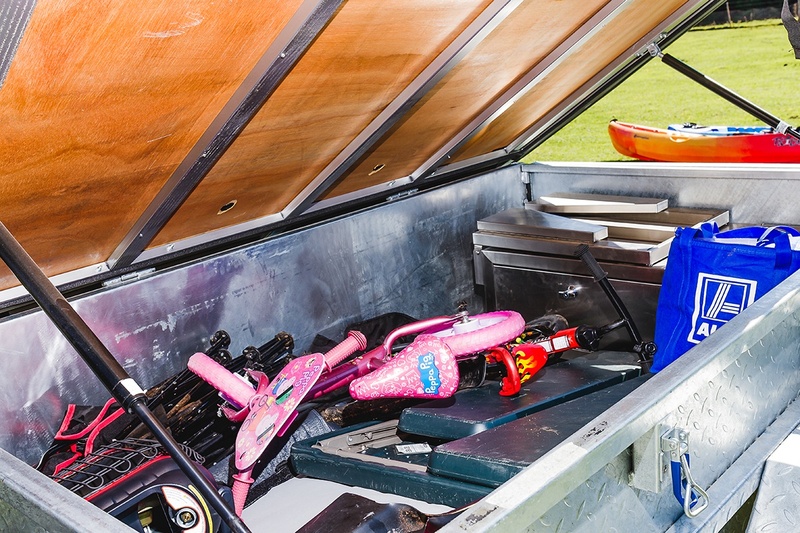 By attaching the bed to the lid, rather than the trailer a forward fold camper allows a seating area up inside the trailer itself. In almost all offerings it converts easily to a 2nd bed making them an appealing prospect for young families with small kids, although two-up travellers may still enjoy a proper lounge and dining area raised high up away from the critters. 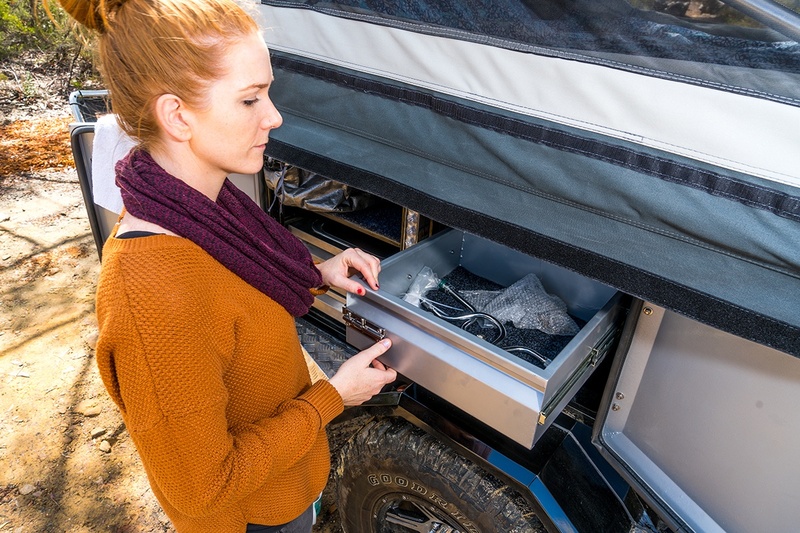 The design does make storage a little more complicated so can be lacking in some models, although the huge benefit is it’ll set up in its own footprint, not requiring three metres behind the camper just to hit the sack. An entry level forward fold will typically run you twice the price of an entry level soft floor, but the simpler setup may get you out on the tracks more often. Some manufacturers are now offering rear slide options. They add a little weight, and a little extra setup time but allow a second bed while still having the lounge setup, or up to three beds. As spec sheets push longer and weights blowout many manufacturers are looking towards composite materials and lightweight alloys to cut down on the girth. A lightweight trailer is a capable trailer. A niche within a niche, compact trailers are a category we made up 30 seconds ago, but is the best way to describe some of the offerings. 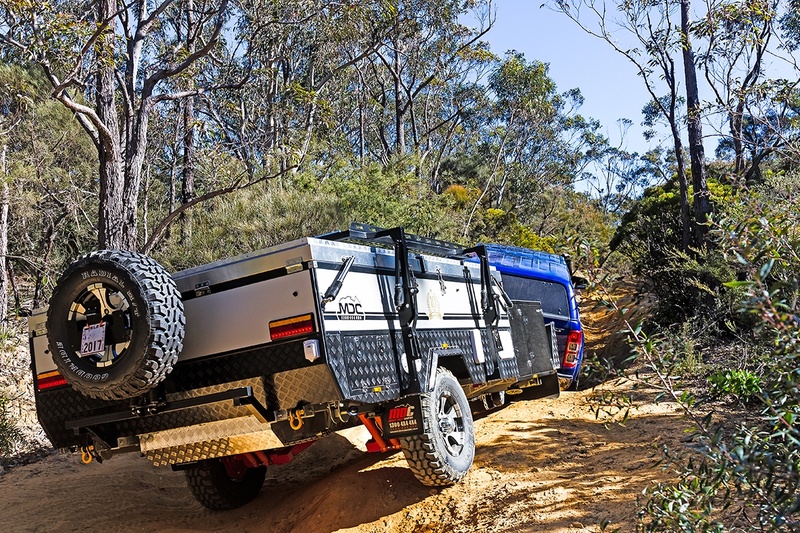 Typically styled like a tradies trailer, only a whole lot smaller, compact camper scale down on the comforts, and scale up on the off-road capabilities. They’re often found sporting little more than a roof top tent (or a glorified one) and punch in around half the weight of a forward or rear fold camper. You do get what you pay for, not only in terms of fit and finish, but layout as well. 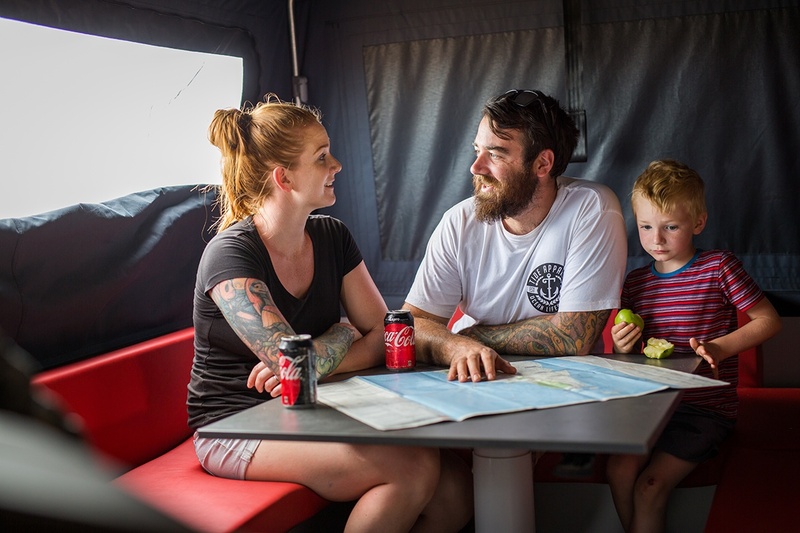 Budget offerings are most frequently little more than a storage box with a basic cooker, while high end models are more of an inside out caravan with plenty of bench space, ample storage, multiple batteries and even diesel heating for winter adventures. That said, you don’t get a lot for the money at any budget. And they’re typically better thought of as a ‘camping trailer’ rather than a ‘camper trailer. If you’re two up-touring, or don’t mind a little longer setup for the kids room they’re hands down the most capable campers money can buy. A strange cross between a forward fold and a rear fold, twin fold campers are the biggest offerings you can buy before stepping up into caravan territory. In their basic form they’re essentially a forward fold camper, although there’s beds folding out front and back. To stop them being 11 metres long they typically arrange the beds sideways and add a little extra width to the camper. The result is a massive lounge area and a double bed at each end. Setup times can be incredibly quick, often quicker than a typical forward fold, although you will pay for it with a weight increase. The extra width also pushes them out to a similar width as an large SUV (2.2m), so may not be ideal behind a Rav4 or other small tow vehicle. With composite panels and lightweight materials some manufacturers are pushing hard to keep weights down in this new category. Quick setup time makes them a real contender against forward fold campers and a viable option even for a sneaky overnight camp. Pantry space can be hit and miss, although they’ll often fit two full size fridges thanks to the extra width. 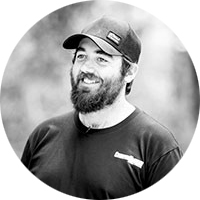 For remote family touring they’re hands down the front runner. A booming market segment at the moment and something that could be perfect (or horrible) for your needs is the hybrid camper. 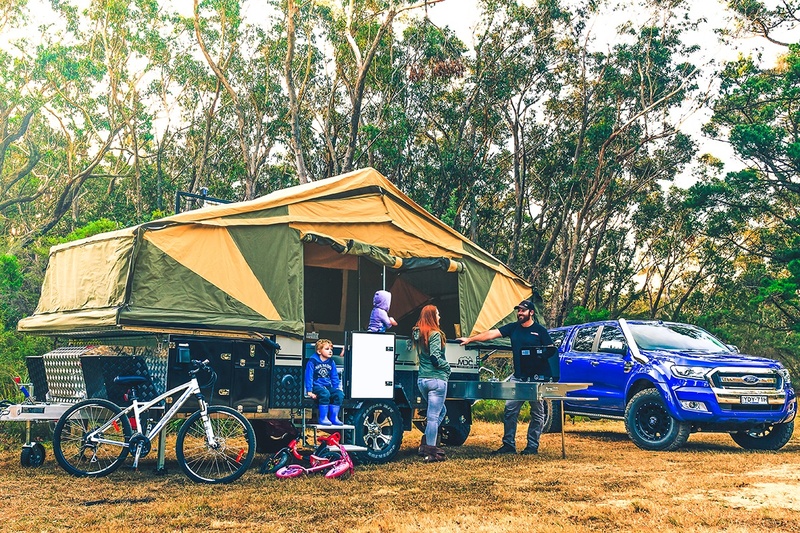 A cross between a camper trailer and a caravan, hybrid campers purposely blur the line between the two and the results are only limited by the designer’s imagination. The one unifying concept between almost all hybrids (so far) has been a hard roof, that’s it. They’ve ranged from super compact caravans, through to pop top and slide out affairs. Hybrids typically have stand up interior living space, and in most cases, are suitable for two-up touring with some concessions for a child or two. They’re often topped off with incredibly quick setup times making them ideal for people on the road and not wanting the fuss of canvas and tent poles. 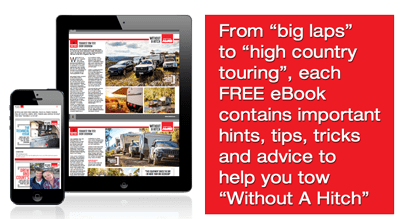 One thing is for certain, with long-haul travellers chasing more comfort and faster setup times it’s going to be an exploding section of the camper market. Years ago caravans are what you bought if you were heading to the local campgrounds, backing onto a concrete pad and not moving for a month. These days they’re a far more adventurous option, especially when you tick the ‘off-road’ box. They’ll typically start at a similar weight and dimension to a hard floor camper, making the only downsides the extra price increase and towing bulk. Although, with literally no setup time you’ll thank it the first time you pull up to camp in the rain and don’t have to fight a bag of canvas. Like hybrids, niceties and tech improve as does your budget. Under $40k can get you into a reasonable two-up setup, while pushing the budget up around the six-figure mark can see you in a fully self-sufficient package with room for the whole family. Weights do increase with size, so if you want to muscle an off-road caravan around in the bush you’ll need to bring a big gun to the fight. With weights constantly dropping due to construction improvements and spec levels climbing more and more ex-campers are heading to off-road ‘vans to simplify their adventures.